Portable mats great for any home or commercial gym. Hey kids, it’s time for daddy to do a little p90x? Can you let me turn off Sponge Bob, and cue world war III meltdown. When you read that, did you feel like you were looking in a mirror? If so, it’s time to turn your garage into a gym. 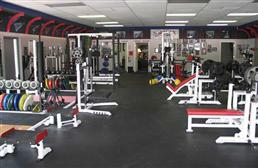 With our garage gym flooring, you will be able to workout as hard as you like in peace. 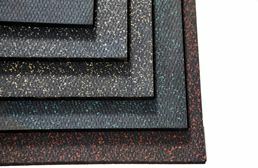 Our rubber garage flooring consists of rubber garage floor mats, rubber garage floor tiles and rubber garage floor rolls. All are made from high-quality rubber and will give you the shock absorbency and durability you desire. For most men, garages are their 'safe havens'. The one area of the house where a man can truly feel like a man. For most men, manly means working on their cars or building some really cool kegerator out of wood that they bought at the local Home Depot. However, for all of those gym rats, who just can't find the time or money to get down to the gym, the garage can be the next best thing. 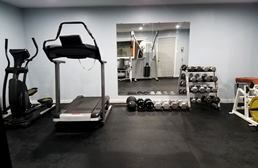 Garages are perfect for gyms because they usually have a flat concrete surface, are outside, and are not on top of another room; so feel free to drop those weights a hard as you like Arnold! 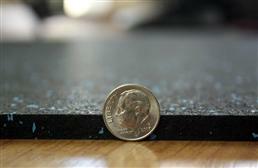 In most garages, a bare concrete floor is standard, but plastic and epoxy floors can also be found in them. 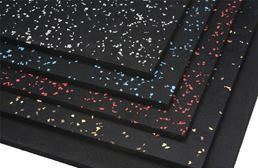 All of these surfaces are not ideal for lifting weights because they can become easily damaged when dropping weights and do not provide adequate shock absorbency. 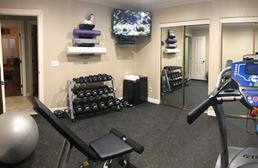 So what type of floor should you use for your garage home gym? 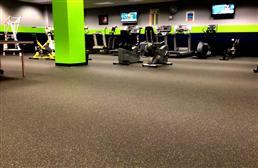 The best floor for any gym is rubber, and we offer rubber flooring in rolls, tiles, and mats. So let's break down each type to find out which one would be best for your application. Rubber mats are the most common floor used in garage gyms. 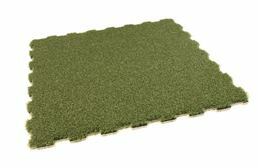 Rubber mats for garages are great because they can be easily removed when not in use. 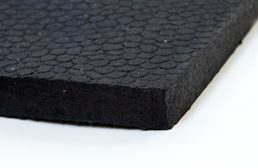 Our rubber mats are offered in a wide range of thicknesses from 1/4” to 3/4” and in various sizes. So what thickness should you go with you ask? Let's break down the different ones to see which one works best. 1/4” - For light weight exercises and floor exercises. 3/8” - For light to mid weight exercises and floor exercises. 1/2” - For mid to heavy weight exercises. Popular with Cross Fit exercises. 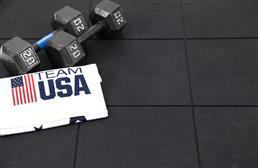 3/4” - For heavy Olympic-style exercises. Popular with Cross Fit exercises and squat racks. The most popular thicknesses used are our 1/2” and 3/4” mats due to their durability and ability to handle the dropping of weights. 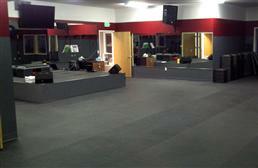 For floor exercises, our 1/4” and 3/8” mats are preferred. 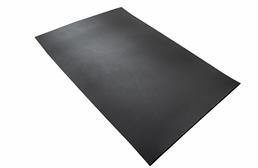 For Plyometrics or jump training, we recommend using our Impact Mats. 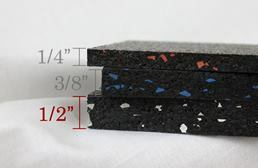 They are less dense than our standard rubber mats and provide optimal shock absorption, which is great news for your knees! 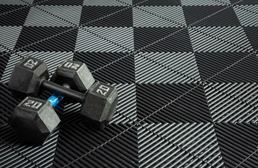 Our rubber tiles are our next most popular option for garage gyms. 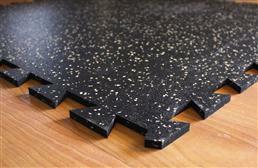 Our rubber tiles can be used as custom sized mats or as flooring for your whole garage. 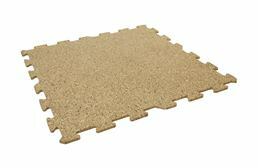 Most of our rubber tiles are interlocking tiles and can be easily installed and removed as needed. 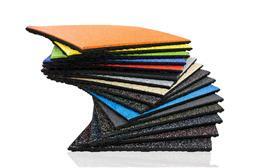 Our rubber tiles come in various sizes, thicknesses, and colors allowing you to create the floor you desire. What thickness should you go with you ask? Well, let's break them down. 6mm & 1/4” – For light weight exercises and floor exercises. 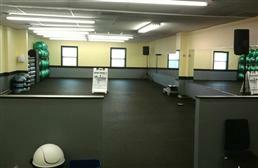 8mm - For light to mid weight exercises and floor exercises. 1/2” - For mid to heavy weight exercises. 1” - For heavy Olympic-style exercises. 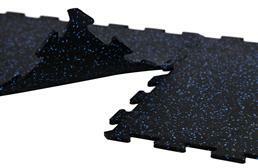 Our most popular rubber garage tiles are our 8mm and 3/8” tiles. These are great for most p90X, TRX and Insanity workouts. 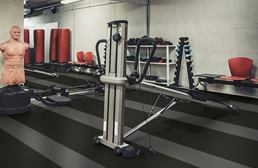 For Cross Fit and other high impact exercises, our most popular garage rubber flooring tiles are our 1/2” - 1” tiles. 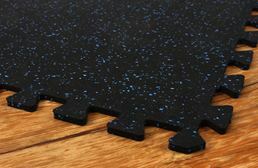 These tiles provide a high level of shock absorbency and will protect your floor underneath when heavyweights are dropped. 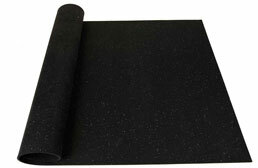 For someone who is looking to cover a larger area, we offer a wide range of rubber rolls. These can be used to floor just one part of your garage or the whole garage. 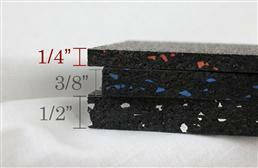 4' wide and as long as you like, to the closest whole foot, our rubber rolls are the rubber garage flooring option. 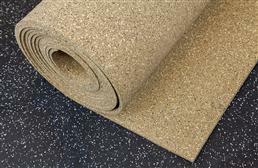 Our rubber rolls come in several thicknesses from 5mm to 1/2” thick and are great for a number of exercises. Let's break down what the different thicknesses are great for. 5mm – Great for floor exercises. 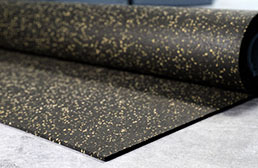 Our most popular garage rubber flooring are our 8mm and 3/8” thick rolls. These thicknesses are great for a range of exercises particularly p90x, Insanity, and TRX. For those wanting to do plyometric type exercises, we recommend using our Impact rolls. 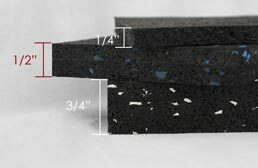 Our Impact rubber rolls are less dense than our standard rubber rolls, providing optimal shock absorbency. 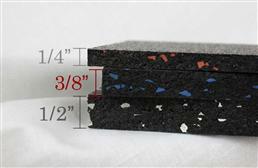 For Cross Fit type exercises, we recommend using our 3/8” thick or 1/2” thick rolls. Now that you have your new garage gym flooring, the next question on your mind is can I drive or park my vehicle over rubber? The answer to that is yes. The only time when there will be an issue is when your car leaks oil. If your car leaks oil, over time the rubber flooring will breakdown. This is mitigated by using of one of our Auto Floor Guards.